Enjoy an evening out and save with Longhorn Steakhouse gift cards that you bought at a discount online. This Western restaurant welcomes guests into a relaxing atmosphere where friendly, attentive servers help them unwind and savor a great meal. LongHorn Steakhouse is part of the Darden Restaurant Group, which includes Red Lobster, Olive Garden, Bahama Breeze, and other popular restaurant chains. Buy LongHorn Steakhouse gift cards at a discount to save on quality grilled steaks and fresh dining. 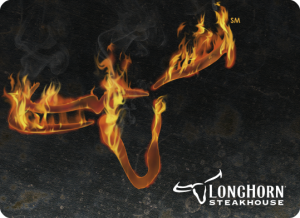 LongHorn gift cards are great gifts for dads, grandparents, and anyone who loves steaks. Shopping Tips: Longhorn Steakhouse physical gift cards can be redeemed in store only. They do not expire. Below is a listing of our favorite places to buy Longhorn Steakhous gift cards. There are always great deals and discount available when buying these so check back often. We will keep this list updated to reflect the best rates when possible. If you love beef, ribs, chops and steak, you’ll really love a night out after you buy a discount Longhorn Steakhouse gift card. Treat the whole family to a special meal, and the only thing you’ll have to worry about is the steak sauce stains on your shirt. Read more on Gift Cards Discount Rates.